BT Vision plans three sports TV channels and pay-per-view for Premier League football | What Hi-Fi? 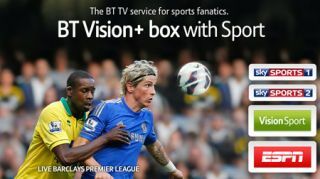 BT is set to offer three channels of sport on its BT Vision service, having secured Premier League football, Premiership rugby and other European football rights. The rumours open up the possibility of various wholesale deals, which would see football and rugby content, currently broadcast on Sky, sold back to Sky or Virgin. As well as live content spread across three channels, BT Vision looks set to offer on-demand and pay-per-view content, too, raising the potential of PPV Premier League football. BT has paid £738m for two packages of 38 Premier League football matches, starting with the 2013/14 season, while also buying up the rights to Premiership rugby. The FT reports that BT wants to offer programmes in the style of popular BBC shows of yore, Grandstand and Rugby Special. Jake Humphrey, currently the host of BBC's Formula One coverage, has already been poached to lead BT Vision's Premier League football coverage. The move aims to bolster the appeal of the BT Vision TV service, while in turn bringing more customers to BT's telecoms and fibre optic broadband services. BT Vision has also joined forces with YouView, launching its own BT Vision content on top of the standard on-demand, internet TV offering from YouView. BT Vision is also offering a free YouView box, worth £299, to customers who sign-up to BT Infinity, the company's fibre optic broadband service. BT has secured the rights to live Premier League football for the very first time, sharing rights with BSkyB in a deal worth over £3bn. ESPN, which currently shares live matches with BSkyB, will no longer show any matches in the new deal, which runs from 2013-2016, which could spell trouble for the US broadcaster in the UK. BT said it would launch a new football channel to cover the games, and planned to supply new interactive features over its BT fibre network. The new deal marks a 70% rise in the price of the rights package, up from £1.773bn, with BT saying it was paying £246m per season for its share. BSkyB continues to have the bulk of the games, showing 116 of the 154 live matches – two of the seven packages that were on offer. BT will show 28 Saturday lunchtime games and 10 matches on bank holidays or midweek. Next season's games will be the last year in the current deal, with BSkyB and ESPN continuing to share the rights.